Crude Oil – When Is The Free Fall Going To Stop? Back in August, I prepared the following piece about Crude Oil: Since then Crude has broken more than a few major support levels and has been on a steady, yet some what volatile decline. 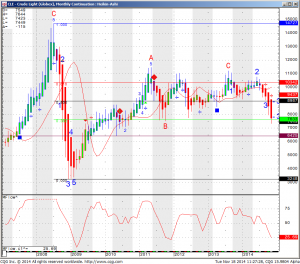 Take a look below at the monthly continuation chart for some of the next levels/ possible targets on the down side. It seems that current prices ( $74.40 basis Dec. contract as of Nov. 18th mid session) are BELOW the lows made in 2012 and 2011 and I believe that a close below $74 will open the door for a test of 64.25 initially. The big question is how does one speculate if he or she agrees to this market view? Straight futures require strong stomach and deep pockets. Crude Oil can easily bounce more than a few $$ before it may resume the down trend. My preferred approach would be to buy veritcal put spreads, where you buy an option closer to the money and sell an option further out of the money. You can read more about this strategy here. Another approach would be to trade a futures spread, for example selling the February contract and buying the June contract. Both strategies are more advanced than straight futures or straight buying calls/ puts but in my opinion will offer better staying power in this volatile market. If you need help with either strategy mentioned above, visit our broker assist services.